Making the presentation were architect Cheryl Gajeske of PGAL Architects, and landscape planner Paul Weathers of Clark Condon Associates. 6. Park Road, a meandering lake with buildings along the edges, a town green near Aldine Mail Route, and small shops facing the street. 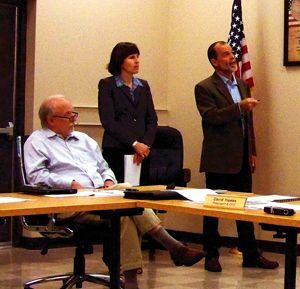 The last scheme was favored by the board, partially because it had been updated from comments made by the Facilities Committee and incorporated several improvements from other schemes. However, it was acknowledged that the plan was only an early working document, subject to much revision be all the interested parties that are participating in the development, including the public. Major elements included in the plan are a classroom and workforce education building for Lone Star College – North Harris, which also includes on-grade parking for 650 cars and room for expansion beyond the first 80,000 sf; District offices and meeting rooms for East Aldine District, totalling 25,000 sf; Harris County Sheriff’s storefront facility, 6000 sf; Harris County Sheriff’s communications building 26,000 sf; and an ESD#1 ambulance building 5000 sf. In addition, the site plan shows 40,000 sf of supporting retail shops, a recreation facility/nature center/field trip building of 15,000 sf, civic outdoor spaces, a possible community or Civic center of 25,000 sf, and other offices for the Sheriff’s investigation units of 20,000 sf. Each of the six schemes avoided building on a flood plain area in the southwest corner of the site, but had pedestrian access to the Keith Wiess Park immediately to the south of the East Aldine site. Each of the schemes has the Lone Star College – NH building in the northwest corner, near the street and adjacent to Stewart Elementary. Due to the failure of the bond issue, construction date of this building would be farther in the future, Hawes said. In keeping with the idea of developing a high quality design, David Hawes suggested that the site become an Urban Land Institute study project for further ideas and designs. 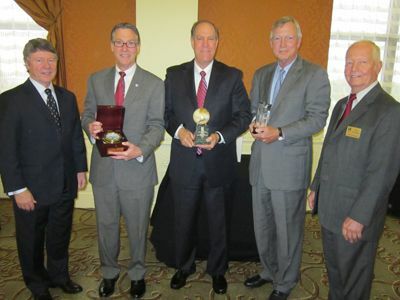 Michael G. Page, Schwartz, Page & Harding, LLP was presented with the North Star Award. Mr. Page is being honored for his many monumental contributions to the successful growth and development of The Woodlands area. The North Star Award is presented to an individual in north Houston who has made a long-term, significant contribution to the region. City of Houston Council Member Stephen Costello, President of Costello, Inc. and longtime member of the NHA, was presented the Compass Award. Council Member Costello received this award for his outstanding leadership role on the Rebuild Houston initiative. This award is bestowed on an individual who is a member of the North Houston Association, and has made a significant contribution to the area and to the programs and projects of the Association. Chris Loomis, City of Conroe Environmental and Water Conservation Manager accepted the Environmental Impact Award for the City of Conroe Water Conservation Program and Projects. Since 2010, the City of Conroe has demonstrated great leadership regarding water conservation within Montgomery County. The Environmental Impact Award recognizes a company or entity for its efforts in preserving and protecting the environment in north Harris or south Montgomery County. 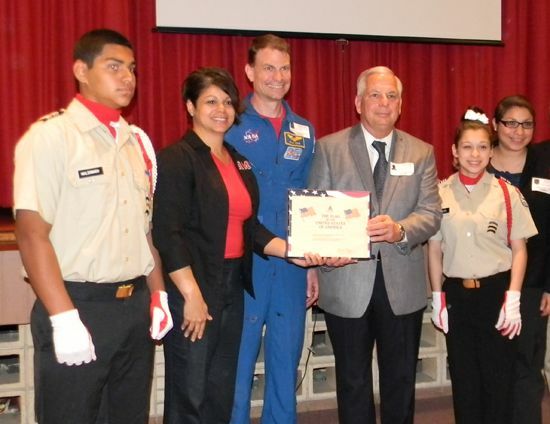 A special guest, NASA Astronaut Dr. Stanley Love, landed at Aldine ISD-Hambrick Middle School last Friday,May 10 along with Congressman Gene Green to speak to students about the importance of math, science and graduating from high school. With a 19 minutes video, from his first spaceflight in 2008 on the crew of STS-122, Dr. Love showed and explained students the process of a spaceflight. “The first thing we need to do in space is get to work,” said Dr. Love. “Taking out of our chairs and taking photographs with a sensor pole of the external tank (because a few years ago during Columbia spaceflight a piece of foam insulation felt off the tank and destroy the shuttle when they entered the atmosphere), so we’re taking pictures of the tank making sure no piece of foam felt off it, he added. Dr. Love explained that their destination was the international space station which is flighting around the earth 200 miles up and 170,000 miles per hour in space and the shuttle needs to catch up with it very slowly to not cause a collision. Their mission was to get supplies to the space station crew and get one of its members back to earth. Sounds a simple task but this implies high technology that only Astronauts can managed. And kids who may study science and math could be the future astronauts. “You can be everything you want,” Dr. Love told students. Science and math are the most important for technology. Selected by NASA in June 1998, Dr. Love continues his work at the Lyndon B. Johnson Space Center, having earned Individual Performance Awards in 2003, 2004, 2006, 2008, 2009, 2010, 2011 and 2012. During the 2008 spaceflight, Dr. Love logged more than 306 hours in space including more than 15 hours in two spacewalks. Dr. Love is originally from Eugene, Oregon. NORTHEAST – In spite of endorsements by many leaders organizations and publications, the $497.7 million bond referendum for expanded facilities for the six campuses of Lone Star College System was defeated in Saturday’s election. The bond proceeds were to be used for one million square feet of new buildings, and related improvements. Unofficial results late Saturday night indicated that the bonds were defeated by a margin of 44.4% FOR, and 55.6% AGAINST the proposition. However, in Harris County the vote was slightly in favor of the proposition, 53.2% FOR, 46.8% AGAINST. In Montgomery County, where the Tea Party Republicans had mounted a concerted effort against the bonds, there were 28.7% FOR, and 71.3% AGAINST. A total of over 18,700 voters went to the polls, and even though 12,033 were in Harris County and 6,738 in Montgomery County, nevertheless the totals amounted to defeat. A few San Jacinto County votes have not been reported but are not expected to change the outcome. In the Trustee elections, the three candidates endorsed by the Montgomery County TexasPatriotsPAC were elected. These are David Holsey, Kyle Scott, and Ron Trowbridge. As a result, two incumbents Tom Forestier and Randy Bates were defeated. Bates was chairman of the Lone Star board that recommended the bond package. Ironically, much of the bond money was to be spent for Montgomery County facilities, which will now not happen. Also in question is how the increased growth in student population, estimated to reach 110,000 students by 2018 will be housed. Opposition to the bonds was led by a Tea Party group, calling themselves TexasPatriotsPAC, with Julie Turner as the president. Their objections included doubts about the enrollment projections as accurate, and whether Lone Star already had too much space. They discribed a scenario where enrollments might decline in the future, based on economic conditions, reduction in federal tuition grants, and changes in the methods and locations of teaching. They also felt the promise not to raise taxes to pay for the facilities might be changed in the future, citing a possible decrease in funds available from the federal and state governments. They pointed out that even though Lone Star System promised “no new tax increase” to pay for the bonds, nevertheless increases in property valuations in the future would mean homeowners would be paying more. One of the new trustees, former LSC professor Ron Trowbridge, was quoted as saying the election defeat heralded a new era at the college, and the goal will be for the administration “to be more accountable, financially responsible and humane to the faculty,” a reference to some employment issues over the last few years. At presstime, officials at the Lone Star System had not commented on the defeat, but it is expected that they will now have to formulate alternative plans to meet the needs of the growing student population, and the requests from at least some of their service area for more programs, classes, and services. 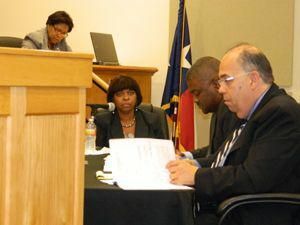 At a special called board meeting last Monday night, trustees of the North Forest school district were supposed to pass eight resolutions to end the employment of teachers and staff, and to begin the process of shutting down the district and merging with the Houston ISD, at the orders of the Texas Education Agency. Instead, the board defied the TEA instructions, and voted NO on two resolutions, and let the others die for lack of a second. Present in the meeting room were several hundred citizens who stood and applauded after each negative vote, chanting “Don’t do it. Stand up to them.”. Also present were NFISD lawyers, and several representatives from the TEA. After each of the eight resolutions died, TEA state conservator Doris Delaney read a statement that said their vote was not effective, and that she had the legal authority to override the No motions and pass the resolutions. After the voting was complete, board president Charles Taylor Sr. made a statement to the public, saying that the board had only voted No because that was the will of the community and they were only following the wishes of those who had voted them onto the board. The next step in the closure process is supposed to be letters to the dismissed teachers and staff, sent by May 6, notifying them of the action. However, a question remains whether the NFISD will actually send these letters, as directed by TEA. If they refuse, it is possible TEA could bring legal action. Later in the week, a spokesperson for the TEA, Debby Ratcliffe, indicated that questions remain about the legal authority of the TEA to terminate contracts, but she indicated that this was an important step so that if the district is merged with the Houston ISD, they will not have the responsibility to pay for unfulfilled terms. HISD has said that they plan on holding a job fair, to fill all positions when they take over the district. This would include any or all dismissed North Forest employees and teachers. However, in addition to the community wishes, the North Forest teachers’ union also objects to the possible firings, according to its president Betty Robinson, and they will be filing legal appeals on behalf of any terminated employees. This action would add to the time required to resolve the matter, apparently. Under state law, any teachers that are dismissed may have the right to appeal and get their job back. It is unclear if this would require HISD to rehire them. In the meantime, several avenues of relief from the closure are being pursued. One, district lawyers have filed an appeal with courts in Austin. Also, Congresswoman Sheila Jackson Lee has led a vocal resistance, and asked for help from the federal government. Finally, the community continues to hold rallies and marches to focus attention on their plight.